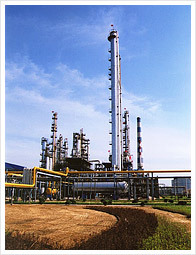 Xuzhou Kaida Fine Chemical Co.,Ltd. Xuzhou Kedah Fine Chemicals Limited (formerly Jiangsu Tetradiamond Dyestuffs Group Company) is one of China’s major producers of vat dyes. With nearly 50 years’ specialization in vat dyes, Kedah has set up a complete and well-equipped production system: the annual capacity is more than 3,500 M/T for vat dyes of nearly 50 varieties. About 40% of Kedah’s products are for exports, mainly to the U.S.A. and the EU. Kedah’s environmentally more accepted products �C the low-heavy-metals vat dyes are particularly well received in overseas market. Kedah values the quality of products as the life of the company. The labs, equipped with complete and sophisticated facilities, keep strict monitoring and control on materials, production processes and finished products to ensure good and consistent quality. Meanwhile, great attention and investments have been devoted to the improvement of technical processes, research and development of new products. As a result, Kedah is recognized as “The Provincial High-tech Enterprise”, its trade mark “Tetradiamond” ranks among “The Provincial Famous Trade Marks” and some dyes of Kedanthren brand are..
・ You are welcome to the website of Xuzhou..
・ Kedah was affirmed as "Jiangsu Provincia..
・ The website has been revised successfull..
・ Kedah has been ISO9001, ISO14001 and OHS..
・ Kedah’s E-type Vat Brown BR has been ap..
・ Kedah was assessed as "China AAA Quality..